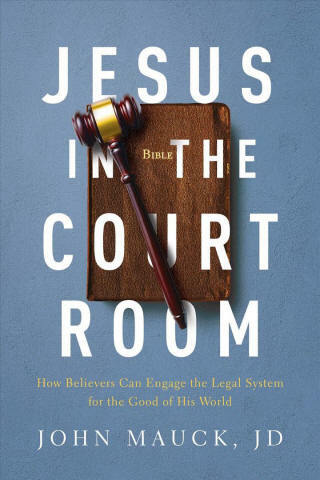 John Mauck, a Christian lawyer, is changing laws to put Jesus in the Court Room, as he calls his new book. He testified before a U.S. House subcommittee that new churches were "effectively zoned out of most parts of Chicago." He noted that half of America's city ordinances allowed no zones where a new church "can freely go." Why, when most Americans are church members? First, churches don't pay property taxes, which modestly increases what others pay. Second, zoning boards believe new churches wouldn't benefit their neighborhood. Therefore, Mauck supported a bill called the Religious Liberty Protection Act. The House passed it by a vote of 306-118. But the Senate did not act. Therefore, three Chicago inner city churches met on Wednesdays of April, May and June, 2000 praying for God's help to pass the law to protect the freedom of believers to acquire property for worship. The Christian Legal Society concluded the bill would gain more support if it also helped prisoners gain religious liberty. They renamed it the Religious Land Use and Institutionalized Persons Act (RLUIPA). That gained the support of liberal Sen. Edward Kennedy and conservative Sen. Orrin Hatch. The bill passed the Senate unanimously and was signed by President Clinton. The result is that thousands of once opposed churches have been built allowing the gospel to be preached. Mauck reports the story of River Hills Community Church in Sauk City, Wisconsin. After a five year search, they found a bank building they could convert to a church, and the bank offered financing. But they encountered a hostile zoning official and a zoning code that did not permit new churches. The church asked Mauck for help. He filed a federal RLUIPA lawsuit against Sauk City, to allow River Hills to use the property. After three days, Sauk City dropped its opposition. But the church had to raise the money to close the deal in a very short time. The church told parishioners "Unless the LORD builds the house, the builders labor in vain." (Psalm 127:1). Within hours the money was pledged. Their attorney was amazed: "That's God! That's the Church! That's River Hills!" Another practical example Mauck reported in his book is about an attorney named Taylor Makepeace, who set up a table outside the courthouse in Colorado Springs, and hung a banner, "Need Prayer?" He called it Courtside Ministries. It spread to Chicago. where a young woman struggled to walk down the stairs from the courthouse. She was walking sideways because of an infection in her leg bone. If it spread to her hip, it might have to be replaced. She was asked by a Courtside Ministries volunteer, if he could pray with her. She said yes. He commanded the pain to leave her in Jesus' name. They prayed for two minutes. He asked her how she was feeling. She replied, "What has happened to me? I'm not hurting anymore!" He told her, Jesus had just kissed her. The volunteer then asked, "Would you like Him to do for your heart what He just did for your leg?" "Yes. I am ready," she replied, praying to commit her life to Christ. Another Courtside Ministries reported that a group of three women, all mothers, converged at the table. To their surprise, each had lost a son who was murdered. Volunteers perceived this as a holy moment. "We asked our infinitely loving God to minister to them." Two mothers extended forgiveness to the killers. The other mother went deeper in her commitment to Jesus. Courtside Ministries is now in 70 cities. Volunteers are asked to serve one morning or afternoon a week. It is "impacting litigants, lawyers, and the legal system to reach the world for God's Kingdom," Mauck writes. Pregnancy Centers have been created to give women an opportunity to see their unborn infants in their womb. About 80% of abortion-minded women who view their child on ultrasound, do not abort. Abortion rates are falling. Pro-Choice groups fight the establishment of Pregnancy Centers. They believe that women should not be pressured to keep the baby. However, Hillary Clinton says, "Abortion should be safe, legal and rare." How can it be made more rare? Mauck praises a new initiative called Qi Yuan Day, the day you were conceived. Count back 280 days before your birthdate to learn your Qi Yuan Day. All should celebrate their Qi Yuan Day. If pro-choices leaders did so, their belief that abortion should be rare - might prompt many to allow ultra-sound initiatives. One lawyer's Christian faith is sparking sweeping change.